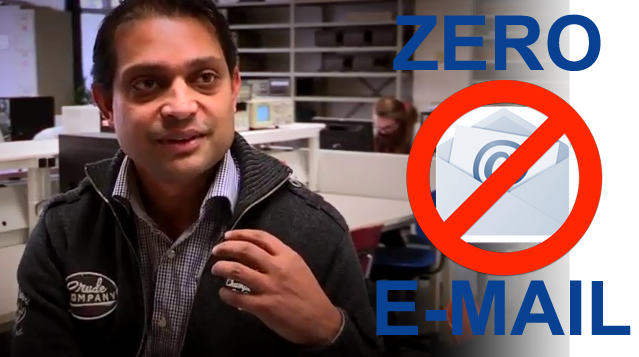 One very interesting project @iFontys is the Project called Zero email. This experiment didn’t involved only teachers but also real life situations with students in a college setting. The general idea is to bring back the huge amount of information and data communicated over E-Mail. I guess many of us suffer and experience the down side of the ever increasing information and connections over E-Mail. On the other hand we do acknowledge that E-mail is still a useful and appreciated way of communicating. So how can we ban E-Mail and go without it. After an experiment with students and teachers we came up with a conclusion that banning E-mail is not the answer. We should teach people how to use E-mail instead. Using E-mail in a proper, efficient, structured and organized way will spare you time digging around your inbox and being distracted every time a new E-mail pop-ups in your inbox. We have to take back control of our Inbox. This is easier done than said. It takes discipline to practice certain rules to avoid that one falls back to old habits. It is not only technology that will make the difference. A major part will always be the people using the technology in a right way. This takes time because it is closely related to the culture and personal way of working. Training and showing the benefits will help to make the move to a better and sensible way of using technology. In the video below we look at this challenge from and for an educational setting. During this project we conducted desk research on zero email. The output of the research did fit our conclusion. Banning E-mail is not the solution. Even if we are going to use other social platforms like facebook, twitter, google hangouts, etc. E-mail will still have it’s place. Of course we will see a shift (which i guess will take a few years) in the way we share information and the way and channels we use for communication. Right now there is no such platform combining all the benefits of the different channels on sharing and communicating.